What is a map? To me, a map is an adventure waiting to happen. As a teenager in the 1990s, I loved to go backpacking along the Appalachian Trail in North Georgia and western North Carolina. Sure, being out on the trail was fun, but the part I always looked forward to was getting my hands on a new Appalachian Trail map pack. For those who aren’t familiar, there are roughly a dozen map packs, each covering about 200 miles of the trail within a state or two. One of the first packs I purchased was titled “North Carolina – Georgia” and it contained a book and several topographic maps covering the southernmost portion of the 2,181-mile trail. Taking a backpacking trip requires a lot of planning. There are dropoff and pickup points to coordinate, water supplies to locate, and campgrounds to scope. Before each trip I would study multiple maps, looking for the perfect route based on my schedule, the abilities of the members in our group, and accessibility. Once I found a route, I’d spend hours pouring over every detail–the topography, water sources, and shelter locations. 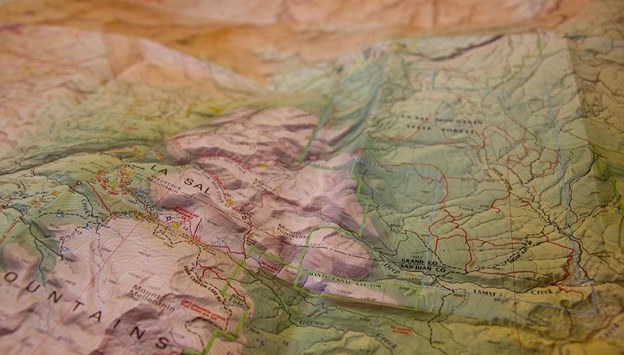 Mostly, I’d find myself just staring at the maps, imagining what I would see at various points along the trail. Shortly after moving to Colorado in the early 2000s, I purchased a topo map of the Pikes Peak region and promptly wore holes through the creases in the map. During the week I’d sit at home and scope out new trails, valleys, and peaks to explore so that every weekend, I could check another place off my list. Going for the hike was always fun, but I think I enjoyed studying the map in anticipation of what I might find nearly as much as the hike itself. Over the years I’ve come to see maps not as physical objects or images on a screen but as tools for sharing new places. Today, my company operates mountain biking and hiking websites that are dedicated to helping others find the best places to bike, hike, camp, and ski all over the world. Maps have always played a key role in making that possible, and it’s amazing to see how far online mapping technology has come in the last decade. Heck, today you can view a topo or satellite map of any spot on the planet with your smartphone! While computers have given us infinitely-detailed maps–just pinch to zoom in–if I’m honest, these developments have taken a bit of the adventure out of maps for me. Viewing a map with geo-tagged photos and markers for every fire ring and log crossing along the trail can make it seem like I’ve already visited a place without even leaving my chair. Not only that, the fact that all these details have been marked, cataloged, and placed on a map just means that someone else has already discovered everything seemingly worth discovering. Where’s the adventure in that? Maps are still adventures waiting to happen, though perhaps not in a format you can view on your smartphone. They’re maps that focus on getting the user to his destination while allowing him to focus on the journey itself. They’re maps that allow the user to imagine what he might find on the ground when he finally arrives. Adventure maps are the dusty pirate treasure maps found in an attic, not Google Street View, virtual reality jaunts. Many maps are adventures waiting to happen… but only if mapmakers don’t give away all the surprises along the way. About the author: Jeff Barber is the co-founder of Singletracks.com and Tripleblaze.com and is an avid mountain biker, web developer, and outdoor adventurer.